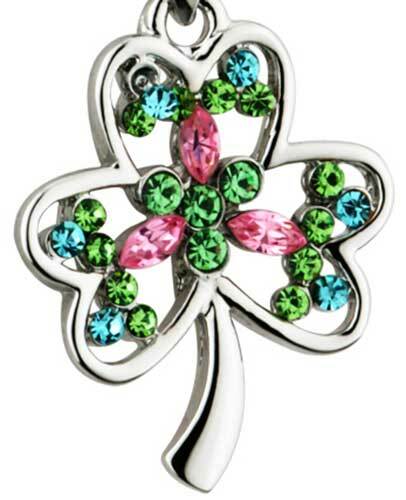 Shamrock necklace is a rhodium plated design that features multi colored crystals. 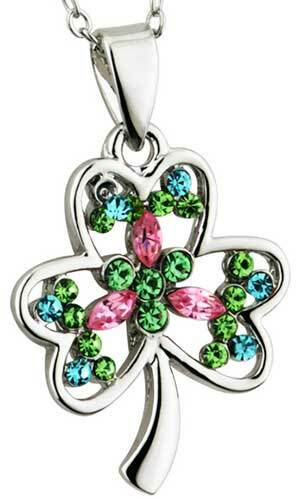 This shamrock necklace features an open design that is enhanced with multi-colored pastel crystals. The shamrock pendant measures 3/4” wide x 7/8" tall, including the jump ring and the chain bail, and it includes an 18" long rhodium plated chain. Shamrock necklace is set within a rhodium plated circle that is enhanced with crystals around the open rim.